The US Open, the last of the calendar Grand Slams, is held annually in New York City, starting on the last Monday in August, and lasts for two weeks into September, across Labor Day Weekend. As a tennis fanatic and native New Yorker, who has been over 40 times, I consider myself somewhat of a US Open pro attendee. For the avid player who wants to watch and learn, there are new bleachers overlooking the practice courts to study the greats, as well as up close and personal FREE Qualifying Rounds for 4 days before the tournament. Whether you want free professional tennis, celebrity sightings, a Honey Deuce (signature drink), long and competitive matches or to introduce your kids to tennis at Arthur Ashe Kids Day, there is something for every player level, age and budget at the US Open. 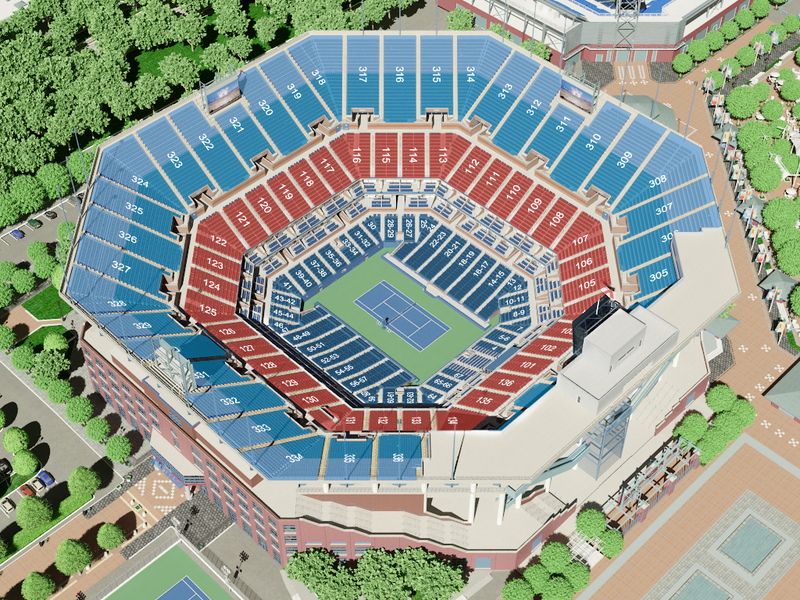 US Open Show Courts: Arthur Ashe Stadium (23,771 seats, retractable roof, no rainouts! ), Louis Armstrong Stadium (14,053 seats) and Grandstand Stadium (8,125). Plus, seating for 5 Practice Courts and 14 Field Courts. The free US Open Qualifying Rounds (always a blast! ), start the last Tuesday before the start of the US Open, ending on Friday of the same week (Aug 20-23, 2019) with Arthur Ashe Kids day that Saturday (Aug 24). The Qualifying Rounds are a great time to get the best shopping merchandise, check out the grounds, catch the greats practicing and collect autographs. The official US Open begins the following Monday (Aug 26). Many people will tell you to get a Grounds Pass, but the reason we don’t offer them here is we feel an Armstrong or Grandstand ticket is almost always a better deal. Often, they are even cheaper than grounds passes and will let you into a stadium with an assigned seat to watch tennis. 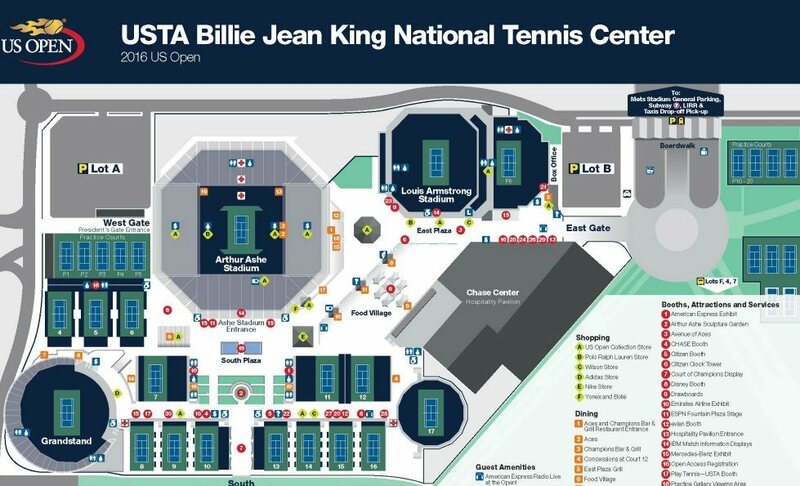 A reserved ticket to Arthur Ashe Stadium provides an assigned seat in the main stadium along with first-come, first-served access to Louis Armstrong Stadium, the Grandstand and all of the field courts. Bear in mind, Ashe is a HUGE stadium, which often surprises a first-timer, who has paid over $100 to sit in a Promenade 300 section seat and feels like they are watching tennis from an airplane. Promenade seats (both lower rows A-O and upper rows P-Z) are HIGH UP and you will be watching the tennis on the large screens. This is fine if your goal is to check US Open off your bucket list and be a part of super-charged and exciting atmosphere, but not enjoyable as a tennis fan who wants to be close to the action. If the latter is your goal, then spend your time and money on a Loge (100s) seat, or go earlier in the tournament to watch the action in the new Grandstand (it’s gorgeous!) or Louis Armstrong. A reserved ticket to Armstong provides an assigned seat in Louis Armstrong Stadium, along with first-come, first-served access to the Grandstand and all of the field courts. Louis Armstrong tickets are sold for the first nine days of the tournament. A reserved ticket to the GrandStand provides an assigned seat in the Grandstand Stadium, along with first-come, first-served access to all of the field courts. Grandstand tickets are sold for the first eight days of the tournament. The US Open takes place in Flushing, Queens NYC, about 30 minutes outside of Manhattan and within 20 minutes of both LGA and JFK. Where you stay will depend on whether you want to stay in Manhattan and explore (stay by Penn Station or Grand Central Terminal), are flying in just for the US Open (stay in Queens) or are driving and need to park your car (stay at a hotel with a free US Open shuttle bus). 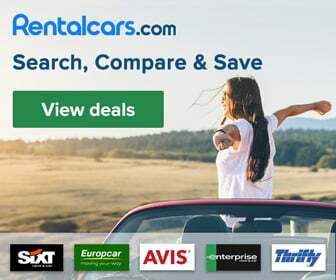 Also check our detailed LaGuardia LGA Airport Guide and JFK Airport Guide, which highlight all hotels with free airport shuttles, Stay & Fly Free Parking, taxi and shuttle costs and more. Love this hotel info? Make sure to read more about the Best US Tennis Open hotels. 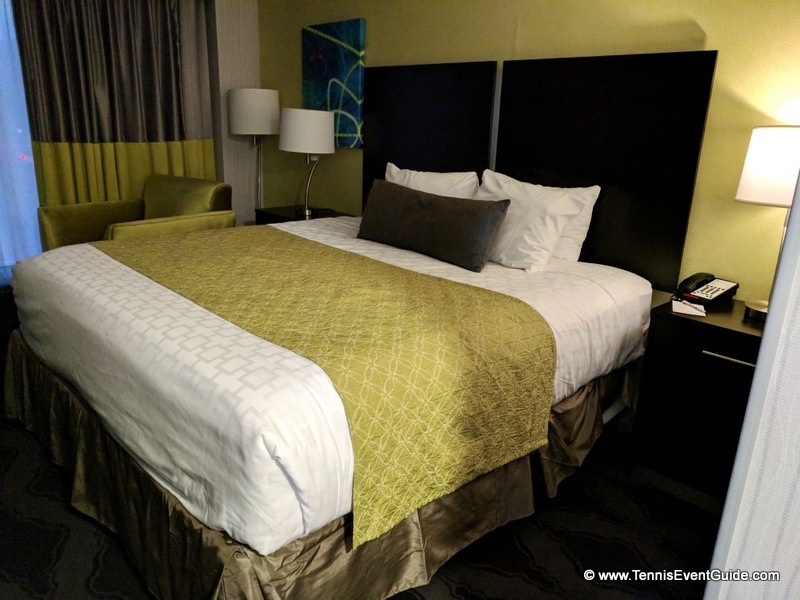 2019 Update – this hotel is not taking reservations at this time (I’ve asked them several times what’s going on but they insist it’s booked up – which is not true. I’ve read elsewhere they are remodeling. There are very few hotels within a 15 minute walk to the National Tennis Center (and Citi Field), but this Best Western Plus is one of them. I actually stayed here to test it out, and it was fabulous, except for one very important note I’ll get to in a minute. It is less than a 10 minute walk to the NTC (you have to walk about 10 minutes from the subway or a taxi anyway), near a quintessential Italian restaurant in Queens, Parkside, and has free parking, free shuttle and breakfast! The catch? It is underneath an above ground subway, which runs every 10-15 minutes and you both feel and hear it. If that’s a sleep issue for you – this is not your kind of place. Keep reading for other choices. If the noise is not an issue, you cannot do better than this Best Western Plus. During a day session, please consider a shaded section. It can be brutally hot and blinding, though the new roof does provide more shade than in the past. The shady sections at Ashe tend to be on the West and South sides since the sun starts on the South side (shining on the North side) and moves towards the West (shining on the East Side) of the stadium. Sections 116-107 (same for 216-207) are directly in the Sun, but 316-307 are shaded because of the retractable roof. For the shade, look at sections 301-328 (Upper Promenade) below and then move down for those looking for Lower Promenade, Loge or better seats. The US Open takes place in Flushing, Queens NYC, about 30 minutes outside of Manhattan and within 20 minutes of both LGA and JFK. For the latest and greatest NYC Events and Things to Do, please feel free to browse the NYC Insider Guide. Below are some highlights of our most popular tours and activities.